The benefits you receive from your Jiu Jitsu training will be extremely varied and personal, but be confident, Jiu Jitsu will have nothing but a positive effect on your life. 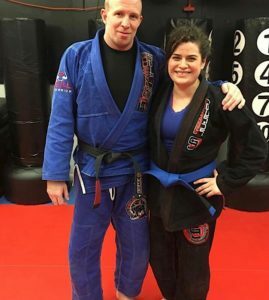 With Jiu Jitsu you will enjoy improved health, a new found body awareness, and the sense of accomplishment of learning something truly worthwhile. Fighting a bigger person will leave you exhausted fast and unable to defend yourself. Myth: Jiu Jitsu is rough and women will get hurt. Truth: It’s Safe !! Your teacher will match you according to size and strength. Once you develop the Confidence you will want to test your new Jiu Jitsu skills on heavier opponents. Are you unsure on how to choose the right club for you? Take a moment to read what some of our students have said, click here, and review our instructors history, click here. Brazilian Jiu Jitsu lifestyle is about training on the mats with your friends who are more like family. Jiu Jitsu also challenges your lifestyle outside the academy. The amount of sleep you get, and what you eat and drink during your Jiu Jitsu off time will affect your performance. I personally invite you to come in and try it for FREE with a Free Week Guest Pass.